Why REI shows us that customer service and marketing must collaborate to provide a coordinated customer experience. The keys to throwing a great conference, and what you need to look out for. How typos and dated paperwork made a bad experience even worse. Why most customers still prefer to reach you by phone. Dan: Join us as we discuss why you're marketing and customer service teams must work together, what we love and can't stand about attending conferences, and interpreting your bipsy results. Joey: Working, learning, and recovering, oh my! There are so many great customer experience articles to read, but who has the time? We summarize them and offer clear takeaways, you can implement starting tomorrow. Enjoy this segment of CX Press, where we read the articles, so you don't need to. Dan: Today's CX Press article comes to us from Josh Rickel, the VP of Product Marketing at Spredfast and it was found on convinceandconvert.com, the company, which produces this very podcast. Josh's article is entitled Six Reasons to Unite your Customer Service and Marketing on Social Media. It talks about how so many companies are still so siloed and how this impacts the customer experience in a very negative way, and he points to outdoor retailer REI and their social media presence as an exception. It looks like there, the marketing and customer service departments are actually working together. Joey: Shocking that marketing and customer service could be friends, both they work in the same darn building. Let's work together. Jay goes on to share six benefits of knocking down the silos that exist between marketing and customer service. Number one, consistent brand voice. Number two, unified customer experience. Number three, smarter planning. Number four, a holistic view of the customer. The number five, data that allows you to influence the rest of the business, and last but not least number six, the fact that you can break down social silos with technology. Six ways that you can benefit from getting rid of the division that probably exists between your marketing and customer service entities within your organization. Dan what did you like about this? Dan: This article spoke to me because when I first got into social media, I don't know, about six years ago. I've been a marketer for many years. At first, I looked at social media and thought, "Well, this is just another marketing channel." Then, what really stuck out to me was the fact that social media was and is the only marketing channel in which customers can talk back. That was fascinating to me. I was so used to other channels like TV, and direct mail, and email where basically the brands get to have a megaphone and shout their message, and we as customers have to sit and listen. All the sudden in social now, people can talk back. That really, really drew me to the channel and got me ... It's what got me interested in social customer care because the reason why people reach back out to brands is often because they're having some sort of an issue with the experience. There's no question in my mind that customer service and marketing at least in social media need to be aligned. I think when you back it out, you realize that they really need to be aligned across every channel. Joey: Absolutely. I'm actually a farm kid in the sense that I grew up in rural Iowa. My dad, if he's listening to the show will be quick to tell any of our listeners that I'm actually not a farm kid, that he grew up on the farm. I grew up in the country but not on the working farm. Long story short, what I've come to realized growing up in rural America is silos are fantastic for farms and they are horrible for companies. So many companies operate in a way where the left hand doesn't know what the right hand is doing. Often, it even exacerbates the problem by the actual silos competing against each other. What I love about this article is it really outlines what should be fairly obvious benefits of kind of getting your marketing and your customer service to work together. Surprisingly, there's not a lot of companies that do it. We spend so much time trying to identify the correct customer and the persona we're going after, and market them and convince them to give us their hard-earned dollars and do business with our company. Then, once they become a customer, it's like marketing kind of stops paying attention to them and customer service takes over, but customer service doesn't know about any of the conversations that happened on the marketing side, and it seems like a very disjointed interaction. That's why I love the kind of more holistic view of the customer that breaking down these silos will give you because if you understand what the customer is acting like more on the marketing side, and you kind of have a view of who your audience is over there, and you share that with the folks on the customer experience side, it works really well. Because what we need to remember I think all of us in every business, customers don't care which department you're in. They could care less about the internal silos within your organization. They just know they're dealing with you. So, you need to make sure that you're team has full visibility into all the interactions that happened across the customer journey, not just the ones that happen to fall under the scope of their specific department. Dan: Yeah. I think that the irony here is that when this is done well, it actually benefits both ends of the silo. For marketing, if you don't ensure that your customer service team knows what kinds of promotions you're putting out into the marketplace, then when customers call about those promotions, your customer service people are going to be in the dark, and they're not going to be able to help people because they're not even going to know that you ran a promotion. On the flip side, I believe that great customer service can be your best marketing. So as a marketer, we should care about how our customers are being serviced because when they're serviced really well, they tell their friends word of mouth marketing, we all know is incredibly powerful. So, customer service can actually help marketers accomplish their goals more quickly and in a better way for the customer. Joey: Absolutely. I think there's a real opportunity here for companies to get more creative about how to break down the silos. This isn't really talked about in the article, but certainly the listing the benefits of breaking down these silos really got me thinking about, "Okay. Well, if we believe that we should break down the silos, how do we go about doing it?" I think the first step in that is really just trying to do things to stop having your employees see themselves as competing against the other departments, maybe do ride alongs. What I mean by that is have someone from marketing go sit in the same part of the building that the customer service people sit in and vice versa. Let them experience what the other co-workers that they have who are in a different department go through on a day to day basis, and try to breed some of those connections between them in a way that's just going to make the communications that are outward facing with the customer feel a lot more natural and organic. We see that in the great example they give from REI in the article where marketing kind of talks about this Force of Nature promotion where they're talking about bravery, and the fact that only 50% of girls report feeling brave, and yet we know this is an important part of success. What does REI want to do with this? One of their customers responded and said, "Well, my six-year old daughter is a force of nature," and showed a picture of her kind of out in nature lifting a stick. It was really cool because it was the support team that chimed in and thanked her for her support and encouraging her daughter. I just think having that come from support as opposed to just from someone else in marketing, made it feel a lot more human. Dan: Yeah. I just want to echo what you said earlier. 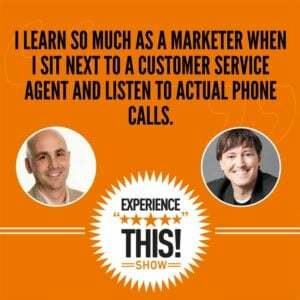 Some of the best experiences that I've had in the business world as a marketer have been when I have sat next to a customer service agent and listened to actual phone calls. There is nothing quite like hearing the real voice of your customer, not the "Voice of your Customer" that shows up on a VOC report but actually hearing your customer what they sound like whether they're from rural America or from the inner city, whether they speak with an accent, whether their old, or young, or somewhere in between, and what kinds of experiences they're having with your company, good, bad, and ugly. I learned so much every time that I do that. I do think that it is incredibly important that you have that sort of an overlap. Likewise, the customer service people in every company I've been in, are so thankful when the marketers come and talk to them about campaigns before they launch, and they often have great ideas for how to improve those campaigns because they know and can predict how customers are going to respond to them because they talk to them every day. Joey: So true. Folks, keep the silos on the farm, not in your organization. Dan, what are our big takeaways from this article? What do you say? Dan: All right. The first one of course is that customer support teams and marketing teams must be on the same page. This is no longer an option, and if they are worse competing with each other, the one who loses is the customer. So, make sure that those two teams are aligned. The second and Josh points this out in his article is that a consistent brand voice and a consistent customer experience are good for your customers. It's what they expect anyway, and it makes dealing with your company that much easier. Finally, the third part. Determining who owns what will go a long way to breaking down at those silos and leading them on the farm, but also it helps to ensure that everyone's working on the right things because everyone knows their own job responsibility and knows what it is that they need to do to best impact the customer experience. As always, we will have a link to the article if you'd like to read the whole thing on our podcast site, which is www.experiencethisshow.com. Sometimes the customer experience is amazing, and sometimes we just want to cry. Get ready for the roller coaster ride in this edition of, I Love It, I Can't Stand It. Alright Joey, you know that I love this segment. See what I did there? Joey: I do. That was nice. You know, I never know how you're going to set this one up, but cheesy as can be. I am affecting you over time. I think I'm slowly rubbing off on you. Dan: That's good. Well, Love It, Can't Stand It is one of my favorite segments of our program especially since this time. Again, we'll be hearing from some of our listeners on the very same topic, which I'm very excited about. Today's topic is attending conferences. Now, Joey you and I have attended many, probably hundreds of conferences in our days, spoken in a bunch as well. Joey: Billion, billions of conferences attended. Yeah, it's billions, and billions of conferences served. Dan: Yeah. So this is definitely something we know something about, but also the folks that we got to speak with about this, we're at conferences. We caught them in the act, and I think you'll enjoy hearing from other people as well. Joey, would you like to get started. We'll start with three things that we each love about attending conferences. Joey: Absolutely, as you mentioned Dan, we get to attend a lot of conferences and one of the things I was trying to do is not only speak at a lot of conferences but actually be on the audiences and attendee. One of the things I absolutely love is when the conference planners or organizers have figured out how to honor the different personas in the audience. What I mean by that is there's some morning people. There's some evening people. There's some people that like a strict rigid structure. There's some people that like a flexible structure in terms of the schedule. I think the best conferences out there, honor all those different personas. Yeah, if you're going to start in the morning that's fine, starting early, but make sure there are events that run late into the night as well for the people that want to be more night owl and skip the morning sessions. Dan: I say that the experience at a conference starts with the emcee. A great and engaging emcee is absolutely critical. I've been to a couple of conferences this year where I knew 30 seconds into the conference that this was going to be a very long and dull conference. It's just like any other experience. You know the old line from Jerry Maguire, "You had me at hello." This is what an emcee is there for. It is to get the crowd excited and interested. I am not lying to you Joey. I attended a social media conference back in May. This woman got up on stage. She's the emcee and the very first words uttered from her mouth were something like this, "Hello everyone, and welcome to the so and so social media conference. We are very happy that you are all here." I'm like, "You have to be kidding me." Like, "I got to listen to this lady for two days?" This is awful. It just totally takes the wind out of everybody's sails, especially at the very beginning when they're really excited to be there. Joey: Yeah. I think if I may briefly riff on that. I think the main problem that a lot of organization's face is there's a belief that the senior executive or the person who's in charge needs to be the emcee. No. Emcee is a skill set. It is a trainable skill set. It is something that you work at and you practice. There are professional emcees. If you're going to spend the money on bringing in speakers, spend the money to bring in a professional emcee as well. You won't be disappointed. It completely changes the experience. Speaking of speakers, I love engaging speakers that teach me something new. When you spend as much time at conferences as you and I do, you hear the same messages again, and again. 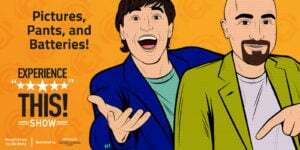 If you're hearing the same case studies, we operate in customer experience and there's probably going to be mention of Zappos and there's probably going to be mention of Amazon. If you are going to talk about some of the more, for lack of a better way of putting it familiar examples, come at it from a very new and different way. Talk about a part of the brand experience that the average person hasn't considered. You want to be engaging and really focus on something new, not something that's already been heard. Dan: I love that. That's actually one of the reasons why you and I don't spend a lot of time bashing the companies that have screwed up because there's more than enough people out there to do that, and that's why we like to focus on the companies that are doing it really, really well. I would also say that it's important to me not just who's on stage but also who's sitting with me out in the audience. I like conferences where I'm sitting with people who are in the same boat as I am. They're facing similar challenges at work, or they're in similar roles, they have similar seniority, so that when we have breaks and networking opportunities, I'm talking to people who understand me and who are maybe facing the same problems so that we can work on them together. That to me is sometimes can be one of the best parts of attending a conference. Joey: Love it. If you believe that the only learning you're going to have at a conference is from the people on stage, you haven't been paying attention. I totally agree. There's so much we can learn from our fellow attendees. Tying together our kind of what we learn and this idea of who's on stage, I really enjoy an event that gives conscious consideration to how to tie the speakers and the messages together into actual steps. I mean, this is something you see from a great emcee. There'll be able to thread together the three keynotes, or five keynotes, or 28 keynotes you've seen over the course of the week into a narrative that allows you to piece everything together. I think all too often there's this expectation that the audience is going to do the distilling of information and drawing the lines for connection. Dan: I'm going to add one last love, and it's going to seem like it's a little bit off the beaten path, but I love it when conferences have great food, great beverages, and plenty of snacks. I think that conference planners often forget about the fact that the customer experience just like in any other industry includes every single interaction that you have with the conference. The breaks are really important because they're an opportunity to network. They're an opportunity to recharge and nothing worse than being told, "Hey, we have a half an hour break and walking out and seeing that they've got pitchers of water and that's about all out there. It's one of those things that you also should invest money in if you are planning your conference because it goes a long way, and people really appreciate it. All right Joey, you can't have a love it, can't stand it without getting to the can't stands. So why don't you start this off? Joey: It's time for me to get worked up. All right, I know this is a pet peeve of mine, but I also know it is a pet peeve of most conference attendees when the speaker or the person onstage is boring and dull. It usually gets compounded when they have boring and dull slides for their presentation. That they will do the courtesy of reading to you, even though you know how to read. It drives me bonkers how many speakers have what I believe to be really good content that is so horribly presented, and so ineffectually presented that the audience doesn't get the chance to even get to the content because they get lost in the dullery of the presentation and how it's performed. Dan: Totally. I mean, if you have a slide that's got more than about eight words on it, it's too many words. Joey: I'll say six. I'll say six. Six words people, six words. If you need more than six words, create more slides because you won't click through 10 slides to get a full paragraph without realizing you're being a fool and you should do it differently. Dan: Totally, agree. As a guy who probably needs to be wearing his glasses more often, but usually doesn't. If I'm sitting far back, I can't even see what you've written anyway. I know I'm going to get an eye roll from you on this one, but it's really important to me at conferences that the Twitter handles of the speakers are conspicuous. The reason is, is that today a lot of people in the audience are live tweeting. I particularly like to live tweet at conferences because it's a note taking device for me. I often go back to my tweets and then write a blog post about what I learned. When I have to spend all the time looking up the speakers and trying to find their Twitter handles and some guy is named John Smith, and I don't know which John Smith he is, it's really, really frustrating. It's so easy to just include a Twitter handle. Most speakers have them. If they don't, it's okay, but the ones that do, that should be really conspicuous and it's such an easy fix. Joey: It's so sweet folks the way he just said if they don't have one it's okay because he knows that his podcast partner is not big on the Twitters. Dan: Hey, you've been doing a lot better lately Joey. Joey: I've been doing better. I've been doing better. I have a full disclosure. I've been getting a little help. My younger brother has been helping out with some of our Twitter activities, given me some lessons and helping out with that. So, we're making progress. Something else that drives me insane is still experiences, or networking events, or icebreakers that feel like a forced march. Folks, the expectation for experience is only increasing. When the experience of some of the places we go, or the products we buy, or the things we do is so fantastic. Then, we show up at a conference and we're doing trust falls. It makes me want to put my head through the wall. If you are going to do an experience with the audience, which I highly recommend, get creative. Make it something new, and different, and interesting. Do some research and have some fun with it because if you're going to get them out of the seats to do a game, or an event, or an exercise, and it's not fun and it's not different and engaging, you might as well not even bother getting them out of the seats. Joey: Because they do too. Dan: ... are going to feel stupid too. Okay. This is an easy one as well, but I cannot tell you how often it happens, bad technology. Again, today when you have a whole bunch of people in a room listening to a conference, they need to be able to plug in and charge their devices. They need to be able to connect to a strong Wi-Fi. These are basic things that you need at a conference, and so often these things are not present. I think it is absolutely required and it makes for a very difficult experience if you are trying. It doesn't matter if you're trying to tweet or not, but even if you're just trying to take notes on a device and there's no plugs and there's no Wi-Fi, it really, really ruins the experience. Joey: I'm speaking in an event in about two months that is selling a VIP ticket for the front row, and the thing that they're selling is that every seat in the front row has power outlet. They're up charging to receive that and those tickets are moving like crazy. So, I totally agree with you. Last thing I'll say that drives me crazy is an overly scheduled conference. You got to give time to breathe. I think so often, conference organizers are like, "We've got to deliver the value. We've got to deliver the value," and they believe that the only value that is being delivered is value that comes from the main stage. I totally disagree with this. Dan: Yup, totally agree even if it's just to go check your email or catch up with the rest of the world. My last pet peeve / can't stand and this has happened to me a lot as well is when the room that I'm sitting in is either freezing cold or boiling hot. Again, this seems like a small thing except think about when you go to a restaurant and you get that seat right by the door certainly in Chicago or Colorado where we live. Every time the door opens and this gust of cold wind come in, your experience is being ruined. When you're sitting in a room all day long at a conference, you want to be comfortable. It's an easy thing. Keep it at 70 degrees or somewhere 68, somewhere that's comfortable but definitely as a conference planner, something that you need to pay attention to. So now, let's hear from some of our listeners about what they love and can't stand about attending conferences. Daniel: Hi, my name is Daniel. One thing I love about attending a conference is when it actually sticks at the schedule. One thing I can't stand about attending a conference is when they do not provide bottled water or any other beverages for you to drink. Jeannie: Hi, my name is [Jeannie 00:24:09], and I love it when a conference has a really great useful mobile app, but one that actually has notifications, and agenda, and all easy to find; love that. I can't stand it when conferences don't vet the speakers, and so you're left with going to a session that you're really excited about and the speaker is not what you expect. Harry: Hi, my name is Harry. One thing I love about attending a conference is meeting like-minded people that will help me drive an entry forward. One thing I can't stand about attending a conference is the lines for lunch because they go on for bloody ages. Dan: Always great to hear from listeners, thank you very much. If you would like to let us know what you love or can't stand about attending conferences, or staying at hotels, or really any other experience that you would like us to talk about please, go to experiencethisshow.com. Click on any episode and scroll down until you see the SpeakPipe widget. Now, this is like a digital voice mail, click on it and you can leave us a message. Just say, "Hi, my name is Dan," well unless your name isn't Dan in which case you should say, "Hi, my name is ..." and actually state your name, and then say, "Here's one thing that I love about X and here's one thing that I can't stand about X," and we will get your voice on a future episode of the Experience This! Show. Joey: It's shocking how often people use 38 words to describe something when two would do the trick. We're looking at you lawyers and accountants. Words matter, and there is no excuse for trying to hide what you mean. We explore words and messaging in this next generation of Say What? Dan: So, my dad recently had a health issue in which he needed to get a biopsy done and the procedure according to his doctor was going to be quick and painless. It turns out that he was in pain for several days after the procedure, which he described as nothing short of excruciating. Now, that would say something about the customer or patient experience wouldn't you think? Joey: Oh, my gosh this is so bad. I'm sorry that your dad had to go through this. I mean it's stressful anyway when you hear the word biopsy and to throw pain on top of it. Is he doing all right? Is he better? Dan: Yes, thank you for asking. He's doing ... He's fine, but this story didn't end there because he had a very strange experience. After the procedure, the hospital gave him this two-page document and this document is so amazing we're going to include it in the show notes, so that you can read it. He was asked to read this document, which is supposed to explain what would happen next. Now, supposed to are the keywords there because the document was absolutely riddled with spelling and grammar errors. Now, you can see when you look at our show notes later that my dad had three different grammar errors that were missing there, some missing words etc. This was probably my favorite. There's another section header that says what are some of the concerns about biopsy results? Now, this time they spelled biopsy right, but the very first concern listed and I can't make this up is the biopsy shows no cancer. Joey: Isn't that what you're going for? Dan: You're right but it's listed as some of the concerns about the results. One of the concerns is that it shows no cancer. Then, in another sentence it says in some areas of the body the pre-cancerous situation is so strongly linked with the subsequent development of cancer that treatment has began. I've read that one 10 times, I have absolutely no idea what that means. Finally it says, in summary a biopsy is an important procedure for a gentleman to have. So, I guess the ladies cannot get biopsies anymore. Joey: It is. It takes a lot for me to be speechless. I'm basically speechless. This is insane. This is absolutely insane. Here's the deal. We don't like to speak about negative customer experiences on this show very much because there's enough of folks out here, but this is one that I think merited talking about because when you are operating in a space that you are delivering a service or a product that has high emotion associated with it like a biopsy would, you have to be on your A game. Now, certainly I want my doctor doing the biopsy to be more focused on the biopsy than on the sheet of paper that they give to me, but that doesn't give you the right to abdicate your responsibility to pay attention to what you're talking to me about as it relates to this stressful procedure and as in the case of your dad, a painful procedure. Folks we got to do better. We got to do better. Dan: Well, and what's interesting is my dad shared his marked-up copy of the letter with the doctor and the doctor didn't seem to care. The response he got was basically like that someone else's job. As we talk about all the time on this show, that's never a good answer in any business. Frankly, I think what you said is right is that it is the doctor's responsibility to make sure that the patient has the right followup materials and that they actually make some sense. The other thing I would say is, and this one particularly bugs me because I was editor of my college newspaper is spelling and grammar matter. They are a reflection on your brand. And this particular hospital has this letter going out that has all these spelling and grammar mistakes and it does make you wonder, "Yeah, I'm much more concerned that my doctor actually knows medicine than how to spell, but it does make you wonder where else they may fall down, and it just is a poor reflection." Joey: Absolutely. If you don't know how to spell biopsy, you don't get to do my biopsy. This is kind of a basic rule. All right. So, to me I think there's some key takeaways here. Number one, make sure that someone actually proofreads the materials that are sent to your customers or patients. Spelling and grammar matters as Dan says. I mean the acorn has landed very close to the tree, Dan next to his father in terms of their appreciation of spelling and grammar, but this is basic stuff. So, folks it's important. Make sure you're proofreading. Number two, check your inventory of documents and make sure they're updated from time to time so that they reflect the current environment. I'm kind of mentioning the fact that this has, at the end it was talking about the important procedure for a gentleman to have. Seriously, let's be conscious of using inclusive language and recognizing that we have patients or customers that are of both genders. Let's stay focused on this. Dan: This week's number is 54% what do you think it means Joey? Dan: Actually, 54% refers to the percentage of consumers who prefer the telephone over all forms of customer support. This statistic comes to us from the Five9 Customer Service Index. A summary of which is found at our friend's website at Oracle CX, the smarterCX.com website if you go to smartercx.com/experiencethis you will find this study as well as some other great content. Joey: I feel like I was one of the respondents to this. I fall into the 54%. I would rather have a telephone conversation with a brand I'm doing business with than any other form of communication. I'm sorry, I'm old school. I like the ability to hear what they're actually saying. I like the ability to explain myself. It feels more natural. It feels more personal. It feels more connected. I get that there are some people that want to do it by chat or email. There are lots of folks that want to do it by phone. So, in this rush to create great customer experiences in the digital world and online, don't forget about the 54% us, Democrats and Republicans alike who would like to be on the phone. Dan: I know it's going to come as a huge shock to you and our listeners, but I am part of the other 46%, shocking. For more great customer experience content, please visit smartercx.com/experiencethis, and we really appreciate you using the Experience This landing page, so our incredible sponsors at Oracle CX. Joey: Thanks Oracle, Wohoo! Thanks Oracle. Dan: Know that you are checking it out, and what you will find there is a brand new website for professionals who are building the next generation of customer experience. They've got news, analysis, tools that will empower you to create remarkable experiences of your own. So, check it out today at smartercx.com/experiencethis.